The back room of Envision Unlimited’s Rose Center, in Back of the Yards, is piled to the proverbial ceiling with arts and crafts materials: boxes of old lace, a package of sequined hats, a children’s doll whose head had, at some point in its transport, become decapitated from its body. Sorting through it all is Monika Neuland, a social practice artist, educator, and consultant who works with agencies that provide services for those with physical and developmental disabilities. Envision Unlimited, the organization which owns the Rose Center, is one of these. The arts supplies are a donation that will help sustain the various arts programs that Neuland leads around the Chicago area, including the mask-making workshop taking place here in the Rose Center. 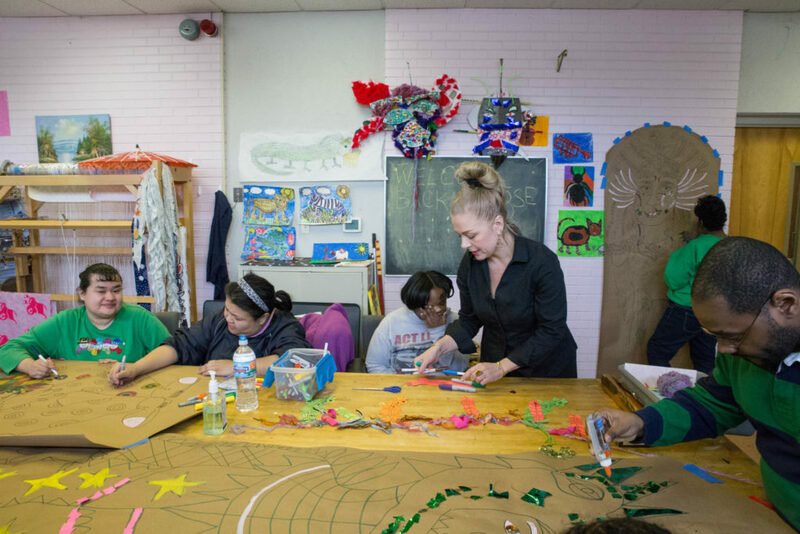 The vast majority of the supplemental enrichment arts programming that Neuland directs—like today’s mask-making workshop—are developmental training programs embedded in the Home- and Community-Based Services (HCBS) Medicaid Waiver, through which eligible service providers can bill the Illinois Department of Health for their costs; in turn, the federal government allows states like Illinois to spend Medicaid funding on these services. One of the purported advantages of the HCBS Waiver is its open-ended status: the federal government is obligated to help states pay for home- and community-based services, as long as those services don’t cost more than institutional care (like a hospital or nursing home). This ostensibly eliminating the potential for triage decision-making on the part of the state. But that may change soon, as the new presidential administration orients its healthcare policy in a different direction. Days after the inauguration, presidential advisor Kellyanne Conway announced the administration’s goal to “block grant” the Medicaid funding structure. It’s an idea that’s been largely embraced by conservative legislators, even before Trump’s administration. Block granting would essentially predetermine the amount of federal funding a state could receive annually, regardless of actual costs throughout the year. True to form, conservative lawmakers have highlighted the decision-making freedom such a reform would afford states. Neuland—whose programs are in large part underwritten by Medicaid Waiver funding—thinks about it differently: “It’s a tricky way to do a funding cut,” she says. “It’s a bait and switch.” And hers are not the only programs that rely on the Medicaid funding: Mark McHugh, CEO of Envision Unlimited, says that nearly all of Envision’s services are embedded within Illinois’s waiver system as well. But Neuland is unfazed. After over fifteen years of this work, she’s a veritable expert at making a lot out of a little—what she calls the “stone soup dance”—having consistently developed her programming in the context of constrained funding. After all, underfunding in the human service sector is no new beast: McHugh says that Illinois’s Medicaid funding has remained stagnant for a decade, despite rising costs across the board. So, service providers, whether individual or organizational, have turned to other means to ensure the ongoing quality of the programs they offer. Neuland, for one, has relied on donations of reused and recycled art materials, like the ones she’s sorting at the Rose Center. As a result, her art programs have flourished, even when the agencies with whom she works lack the means for all of the necessary supplies. Neuland and McHugh talk about other strategies that have worked for both of them: namely, space sharing and forming partnerships with other local organizations in order to pool resources. Even this is a break with how things were done just ten years ago. Both she and McHugh talk in particular about a partnership formed between ZeroLandfill, a volunteer-run organization that diverts materials found in landfills toward educators and community artists, and Envision Unlimited, resulting in a biannual giveaway of art supplies staffed in part by the physically and developmentally disabled clients of Envision. More than being coping mechanisms, strategies like these allow the organizations involved to achieve their missions to a degree never before possible. In the aforementioned partnership, ZeroLandfill is able to pursue the social and environmental dimensions of its mission, while clients of Envision are included in the community by volunteering in the biannual event. “We have people who are now integrated into the community in ways they never thought they had the opportunity to do,” McHugh says. But McHugh emphasized that creative practices and collaboration can only do so much. “The funding challenges that exist right now still need a solution,” he says. “You can’t get the same amount of money forever and expect to be able to pay for increasing costs—it doesn’t work.” How the funding crisis will play out—especially with the possibility of a “block granted” Medicaid system—remains to be seen.